Papaya is considered to be one of the healthiest and nutritious fruit. 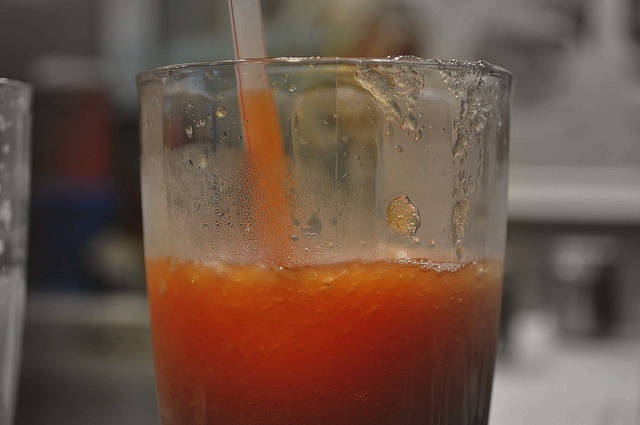 Papaya juice contains antioxidants somewhat more effective than the antioxidant vitamin E. Papaya smoothy drinks are easy to make with a little sugar syrup to sweeten it, unless you want a health drink. Put sugar into bowl. Pour freshly boiled water over it. Stir till sugar dissolves. Cool. Cut papaya into big cubes. Place papaya on aluminium sieve on a bowl. Pass papaya through sieve with a wooden spoon. Pour papaya juice and syrup into a glass jug. Add enough cold water to taste and mix well. Cool in refrigerator before serving. You may use 280ml milk and 280ml cold water in place of 560ml cold water. 480ml water melon may be used in place of papaya. Papaya is a healthy fruit filled with much nutrition. I never use sugar while making fruit juices. You can also add some pieces of strawberries to make it more taste and colourful.